Happy Adoption Month! My name is Elizabeth and I’m so honored to be sharing about adoption on M2M; it has been a passion of mine since I was a kid. I had always planned to work in adoption in some capacity, but when I was doing my internships at adoption agencies in graduate school, I got very disenchanted with the process. The agencies were so careful to remain neutral about adoption that they ended up promoting parenting over adoption most of the time. Don’t get me wrong, I know adoption is not the right choice for every person experiencing a crisis pregnancy or even a crisis in their lives that requires them to evaluate options for their children, but I firmly believe that it is the right choice for some. In any case, people deserve to know that it is an option, and what adoption is really like in the 21st century. After grad school my job options were limited given the economy, so I got together with my dad, Dewey Crepeau, and Tina Tyra, an adoption facilitator in California. We decided that an agency could provide more services than our separate areas of expertise and combined forces. 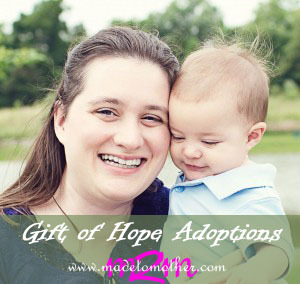 Out of that meeting A Gift of Hope Adoptions was born, and we have been going strong for nearly ten years! We have been able to provide the social services necessary to a good adoption experience for both birth parents and adoptive parents. With Dewey’s invaluable legal expertise ensuring that adoptions are always done the right way and Tina’s experience in matching and making sure prospective birth parents have choices in the adoptive family they select, I believe our agency has the keys to healthy adoptions. I think as parents, particularly as mothers, we know that our primary focus has to be on our children. We are constantly evaluating their personality, interests, and learning styles in decisions about school, diet, social activities, and extra-curricular activities. Sometimes we grieve that we can’t give them more, and sometimes make hard sacrifices to do so. We celebrate with our child as they succeed and we help them learn from their failures. Often, we are blamed for everything but still bring out the lioness inside when our children need protection. We are mothers, it’s what we do. I take that approach with adoption, as well. Even though we work with all members of the adoption triad (birth parents, adoptive parents, and children) our focus has to be on the child’s best interests. The child is not paying for the services, and the child is not making the decisions, but the child is still our primary client. When you are considering adoption – whether as a birth parent or an adoptive parent – I encourage you to attempt to put yourself in your child’s position, and evaluate best interests from there. That may lead to some tough introspection, and even tougher choices. You may find that your child’s best interests make your choices clearer or cloudier. Every child needs a mother, though, and they deserve our best. In adoption a child has more than one mother, and that is actually a very good thing. As I often say to our clients, particularly those who are afraid of contact between birth and adoptive families (which is actually now very common and very healthy in adoption), you can never have too many people who love your child. Elizabeth Ehlen graduated from Hillsdale College in 2002 with a dual degree in History and Sociology & Social Thought, with special departmental honors in Sociology. She attended Washington University in St. Louis to pursue her Master’s in Social Work and graduated from the George Warren Brown School of Social Work in 2004 with a MSW, concentrating in Children, Youth and Family. In 2005, Elizabeth cofounded A Gift of Hope Adoptions in Missouri with the help of Dewey Crepeau, and Tina Tyra. In addition to her adoption work, she has also written an ebook designed as an introduction to adoption for adoptive parents, Adoption Options: For Prospective Adoptive Parents. She is married to her college sweetheart, Matt Ehlen and they have two sons, David and Daniel, and one daughter, Rachelle. Elizabeth loves being a mommy, and works primarily from her home office in order to take care of her babies as well as her children through A Gift of Hope Adoptions. That is awesome that you have a chance to help people in this way! I can’t wait until I can get involved in the foster/adoption system someday. It might be a while still, but I would count down the days if I knew how many!